Christmas is just around the corner and before you know it you'll be attending several gatherings, eating lots of food and going on vacations. But is your health ready for the holiday season? The holidays can take a toll on your health for a variety of reasons. One is the change in temperature. The weather tends to be cooler during Christmas season which may make you and your family prone to catching cough, colds and fever. Another is being exposed to large crowds whether in the malls or during Christmas parties. You will never know if the person you come in contact with has good health status or not. There are more reasons why you may not feel so wonderful during the most wonderful time of the year. 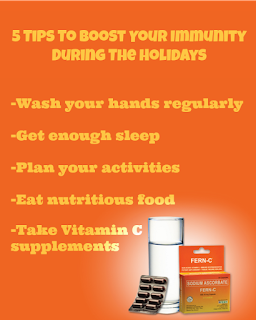 It is therefore important to take steps to keep you and your loved ones healthy this holiday season. 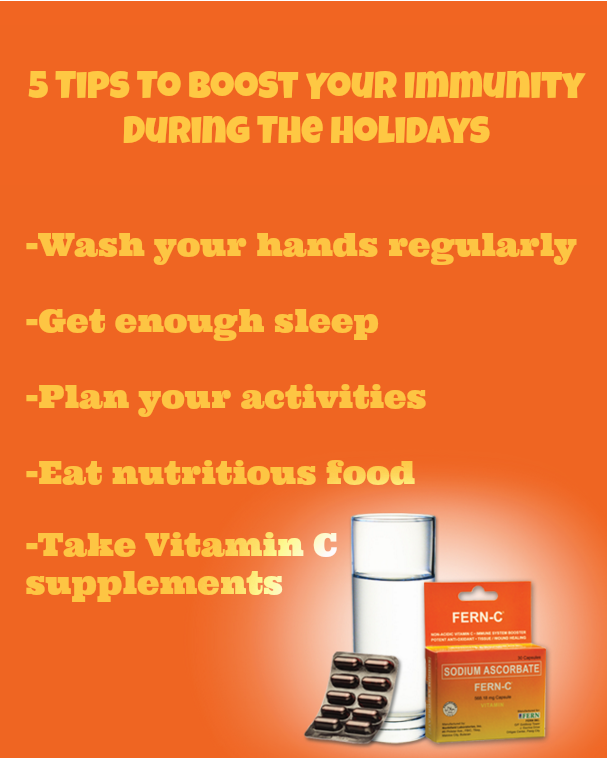 Give the gift of health to yourself and others this Christmas by following these five tips to pump up your immune system. Wet your hands with clean running water, apply soap and rub hands together briskly to make a lather for 15 to 20 seconds. Afterward, rinse your hands well under running water and then, dry hands using a paper towel. Finally, use your paper towel to turn off the faucet. If you don't have immediate access to soap and water, you can use alcohol-based handrub instead. Studies have shown that adequate sleep helps our immune system's response against illnesses and lack of sleep impairs it. Ongoing sleep deficiency is also linked to diseases of the heart and kidneys, among others. Hence, it is necessary that you give yourself enough sleep. The recommended sleep duration for adults is 7-8 hours and longer in younger age groups. Avoid holiday stress by planning your activities. Make sure that you don't over schedule your time and take on more than you can manage. While it is inevitable to over-indulge on food during the holidays, don't forget to take in foods that are packed with the necessary nutrients to give you energy, reduce your stress levels and help you fight against diseases. These include fresh fruits and green leafy vegetables which are rich in fiber and antioxidants. Also remember to eat in moderation. Vitamin C or Ascorbic Acid is an antioxidant that fights disease-causing free radicals. It is a huge immune system booster and an all-around power-packed vitamin. It is also required for tissue growth and repair, adrenal gland functions, and healthy gums. You can get Vitamin C from your regular diet but it is often not enough so you need to take supplements for some added immunity. One of the most popular and trusted Vitamin C supplement brands available in the market right now is Fern-C, which is Vitamin C in Sodium Ascorbate form. Unlike the traditional Ascorbic Acid preparations, Sodium Ascorbate is non-acidic and will give you all the benefits of Vitamin C without the stomach discomforts usually associated with Ascorbic Acid. You can even take Fern-C on empty stomach. Learn more about Fern-C by following them on Facebook, Twitter and Instagram.